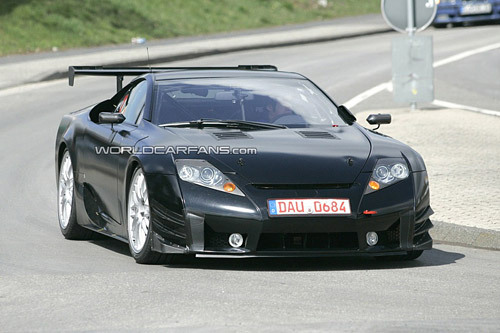 Race-Ready Lexus LF-A spotted near Nürburgring! World Car Fans (whose spy photographers are responsible for the image above) also received word that this Lexus could very well be part of the 24 Hours Nürburgring Race held in May, and that an official launch of the production model might happen at the same time. Entering the LF-A in such a legendary race would be quite daring on the part of Lexus, an incredible trial-by-fire if there ever was one. For more photos of this raced-up LF-A, check out World Car Fans, and cross your fingers for the end of this epic development cycle.